"When is our next free-writing session?" This has been the most-asked question in my classroom over the last fortnight. After Easter, we started weekly free-writing sessions to encourage a love of writing in our year four classes. These have continued as and when possible. Free-writing sessions have been so successful in help kids enjoy writing and become better writers, I thought it was worth sharing the slides and notes from these six sessions. 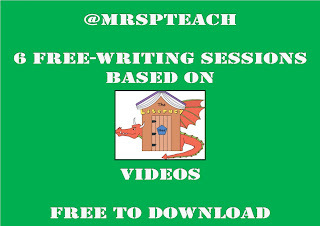 Each lesson is based on a video which can be found on The Literacy Shed website. Rob Smith has created an amazing resource for teachers to use to inspire pupils in their reading and writing. Although called free-writing, we encourage the children to base their writing on the video stimulus for the week. We used the videos in the session notes and slides (freely downloadable by clicking the image at the bottom of this post) in year four but they are equally transferable across KS2. Please check the videos are appropriate for your cohort or class before using them - particularly Alma, which is a little creepy! Pupils review their target from the previous week. Teachers collect appropriate vocabulary from children on the main whiteboard. Teachers model possible starters to different pieces of writing based on the stimulus. Children are given talk time before they start writing to discuss their ideas. After talk time, pupils work silently. Children write in a separate free-writing book. Various word mats, sentence prompts and dictionaries/thesauruses are out at tables. Pupils edit their work throughout the writing time and afterwards. Children get the chance to read through someone else's writing and share their own. Teachers ask what theme or genre children would like a free writing lesson on for the following week. Teachers read and check children's work and simply mark with a target for the next week. We have found that by giving an incremental target for children to work on in the following session, weekly marginal gains have led to overall more effective pieces of writing. It also doesn't take long to complete and it focuses the children on just one thing. Before each session, we discuss any whole-class errors or areas for improvement. Pupils are proud of the work they have done and we are happy with their progress since the first free-writing session. Here is an example of slides for one session (children requested one about sports) and below that is a clickable image for you to view and download all resources. From this, children wrote about clones in chess, gymnastics, skiing, netball, basketball and hockey as well as some great commentaries of the final game in the video. This really captured their imagination. Click image to view and download all resources.